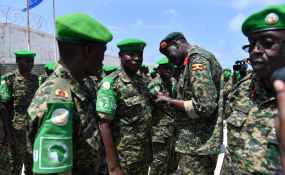 AMISOM awarded service medals yesterday to a contingent of troops from the Uganda People’s Defence Forces (UPDF) in recognition of their role in the restoration of peace and stability in Somalia. Burundi's threat was sparked by an announcement that Burundi will have shed 1,000 troops by February 28. On February 19, President Pierre Nkurunziza and his Somali counterpart Mohamed Abdullahi Farmajo held a meeting in Bujumbura and called for an urgent summit of the five troop contributing countries to review the decision by the AU Peace Support Operations Division, which Bujumbura rejects as discriminatory. "There is a decision that was taken by the Peace and Security Council of AU that we Burundians didn't welcome and we know Somalia wasn't pleased with it. That's why we have called for an urgent summit so the decision can be reconsidered," said President Nkurunziza at a press briefing. Later on Thursday, the Burundi parliament debated the matter and called on the AU chairperson and Egyptian leader Abdel Fattah el-Sisi, to convene a summit of the TCCs to address the "injustice" against their country. The MPs made the call on the day 200 soldiers left Somalia for Bujumbura as part of the withdrawal. "Instead of planning to pull out 1,000 troops from Amisom, the African Union should prepare for the withdrawal of all Burundian troops," said Mr Ntahomvukiye. CONOPs is part of the implementation of the Somalia Transition Plan, which involves reconfiguration of the forces into new sectors in preparation for final handover of security responsibility to Somalia's security forces by 2021, when Amisom finally withdraws. They include; phased and conditions-based troops' withdrawal and handing over of priority locations in Mogadishu to the Somali Security Forces; degrading Al-Shabaab and securing main supply routes; and supporting the Somali National Army as it takes full charge of the country's national security responsibilities.